Despite the articles you might read on this website, there are many more pseudoscience pushers than the ones we observe pushing their anti-vaccine religion. One of my favorite ones to mock is homeopathy, a quack treatment that is essentially pure water (see Note 1). Not only is it pure water, but it’s very expensive pure water. It’s much more expensive than your GMO-free, gluten free water, taken from the melting glaciers in the Alps (thanks climate change deniers). It is a scam that tries to convince people that a vial of nothing more than water (and sometimes ethanol) has some magical medical properties. Magic that requires suspension of much of our scientific knowledge of chemistry, biology, and physics. Let’s take a look at homeopathy, just so you know more about this expensive water. A lot of people, mostly Americans, conflate homeopathy with natural medicine, like herbal medicine. It isn’t. Basically, homeopathy, known as the “law of similars”, relies on belief that “let like be cured by like”, and is a term coined by Samuel Hahnemann, a German physician who was appalled by the state of medicine at the time, the late 1700’s. And frankly, the state of medicine at that time was pretty bad, so any new idea might have been worth trying. Unfortunately, when Hanneman was alive, basic scientific knowledge was missing – cell theory and germ theory were a few decades from even a basic understanding of those scientific principles. Homeopathic potions are prepared by serially diluting the original substance (could be anything from diseased tissue to arsenic to snake venom plus mercury) with shaking and forceful striking on an elastic body, which they term succussion. Each dilution followed by succussion is assumed to increase the effectiveness. Homeopaths call this process potentization. So far, it’s just merely diluting and shaking, so nothing special there. This dilution process is such that there is only a tiny possibility of any molecule of the original substance showing up in solution. That’s why it’s just water. The dilution methodology is precisely described by Hahnemann. The first dilution is one part to 99 parts water. Then, one part of that first dilution is then diluted in another 99 parts water. 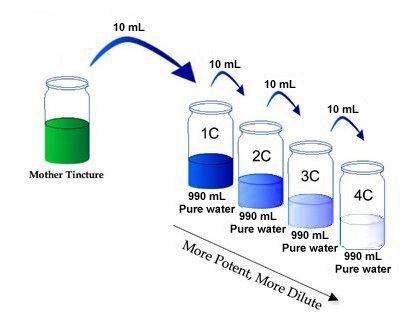 Each of these dilutions is called 1C, so two dilutions would be called 2C, with one part of the original similar diluted in approximately 10,000 parts water. But it doesn’t stop there. Homeopathy uses >30C dilutions, which means that the original substance is diluted 30 times. Now that might not seem like much, but if you look at the math, there is no chance that even single molecule of the original substance exists in this solution. So let’s look at the math. At 30C, the dilution is now 1 part substance to 10^60 (or 10 followed by 60 zeroes) parts water. You would need to drink 10^34 (or 10 followed by 34 zeroes) gallons of water (which is about 10 billion times the amount of water on earth) just to get one molecule – one single molecule of the original substance. Since water poisoning is a thing, you probably should not consider this. Now diluting substances to create a physiological response is a well known, evidence based method in medicine. For example, allergy hyposensitization uses extremely diluted antigens (say cat dander), while slowly increasing the concentration to build a tolerance to the immune response. But the dilution is substantially reduced, maybe 1-2C at most. Moreover, this methodology is based on the science of immunology, not magical processes. We know why this works to reduce allergies. Homeopaths overcome this mathematical issue by stating that water has a memory. This claim is based on a long-disputed, unrepeated, and basically, disregarded experiment. The results of our meta-analysis are not compatible with the hypothesis that the clinical effects of homeopathy are completely due to placebo. However, we found insufficient evidence from these studies that homeopathy is clearly efficacious for any single clinical condition. Is it even plausible that water has some memory? Water is a very simple molecule with 2 hydrogens and one oxygen. It has a set spatial orientation. You cannot configure water in an infinite number of ways. To invent a way that water has a memory would require us to throw out all that we know about the fields of chemistry and physics. Sure, all science is provisional – maybe something will be found that will tell us to throw out all we know about chemistry and physics. But we only do that with robust and substantial scientific evidence. And trust me on this point, if you had that research, you’d be getting about 5 Nobel Prizes all at once. Remember, if one is going to make an extraordinary claims, we demand extraordinary evidence. If you want to tell us that water has memory, because a reasonable scientist could not even imagine that, then we all want incredible evidence to support that idea. Furthermore, what magic would control water’s memory? Does that water remember being in toilet bowl? Or flushing out chemical tanks? Or the dolphins, whales, fish, and algae that circulate through all of the water on earth? The concept that water has memory is ludicrous and laughable – it is not only plausible, but impossible for a water molecule (or, if you see Note 1, a sugar molecule) to remember a nearly infinite different number of molecules. These molecules cannot “remember” even one different molecule. That’s not what molecules do. OK, valid point (I’m conversing with myself here, but don’t judge). Water salesmen, I mean homeopathy proponents, like Dana Ullman cherry-picks data (often cherry-picking one sentence out of a negative paper), then trolls Twitter and Wikipedia (where he has been blocked and banned so many times, he must hold some record) with this cherry-picked data. It’s almost laughable. Ignoring the water salesmen (let’s be honest, that’s what they are), the best data say that homeopathy is water – just water. A meta-analysis (which is the pinnacle of quality science) of over 225 medical studies and 1,800 peer-reviewed papers has found no evidence that homeopathy has any credible medical effect. Moreover, this study found 57 other systematic reviews of homeopathy that supported this conclusion. This study was launched and supported by the National Health and Medical Research Council (NHMRC) of Australia, which is tasked to determine what are the best medical practices for its citizens. The NHMRC employed The Australasian Cochrane Centre, a division of the Cochrane Collaboration which specializes in publishing systematic reviews in medicine, to review and vet the meta analysis. This study should be considered one of the best to ever review homeopathy’s lack of clinical effect. The committee that did the review included seven distinguished researchers, physicians and statisticians from across Australia. None had ties to pharmaceutical or nutraceutical companies for those of you who are inclined to conspiracy theories. To be fair, a tiny number of the 1,800 papers reviewed showed some positive effects from homeopathy. However, careful analysis indicated that those “positive studies” had a small number of patients (larger numbers can eliminate bias and other statistical issues), were poorly designed (making it difficult to distinguish between positive and negative results), were carried out with poor oversight, or, the most condemning, were badly analyzed with misinterpreted results. The NHMRC (and Cochrane) determined that these positive results were not sufficient evidence to reliably support a hypothesis that homeopathy has ANY clinical effect. In other words, it’s just water. included in the study did describe research where homeopathy was claimed to be effective, analysis reveals that the studies had too few participants, were badly designed, were carried out with poor conduct, or were reported inaccurately. Either way, National Health and Medical Research Council reports that the seemingly positive results could not be used to reliably support the use of homeopathy. People who are considering whether to use homeopathy should first get advice from a registered health practitioner. Those who use homeopathy should tell their health practitioner, and should keep taking any prescribed treatments. This is a massive meta-review with significant depth and breadth of scientific research into homeopathy. And we can now conclude very clearly that homeopathy cannot cure anything but thirst, but at a great economic price. The only adverse effects from homeopathy could be water poisoning. Or sugar toxicity. There is substantial and robust clinical evidence that homeopathy does not work. Not even close. But homeopathy can cure thirst. There are homeopathic remedies that are in pill form. Instead of diluting 30C in water, they dilute it 30C in sucrose. Yes, they are pure sugar pills that contain 0 molecules of the original substance. And, no sugar doesn’t have a memory either. Editor’s note – this article was originally published in March 2015. It has been republished with new research, an excellent quote from the inscrutable Orac, reformatting, new snark, and, of course, more science. Linde K, Clausius N, Ramirez G, Melchart D, Eitel F, Hedges LV, Jonas WB. Are the clinical effects of homeopathy placebo effects? A meta-analysis of placebo-controlled trials. Lancet. 1997 Sep 20;350(9081):834-43. Erratum in: Lancet 1998 Jan 17;351(9097):220. PubMed PMID: 9310601. Maddox J, Randi J, Stewart WW. “High-dilution” experiments a delusion. Nature. 1988 Jul 28;334(6180):287-91. Erratum in: Nature 1988 Aug 4;334(6181):368. PubMed PMID: 2455869. National Health and Medical Research Council. 2015. NHMRC Information Paper: Evidence on the effectiveness of homeopathy for treating health conditions (pdf). Canberra: National Health and Medical Research Council; 2015. Stub T, Musial F, Kristoffersen AA, Alræk T, Liu J. Adverse effects of homeopathy, what do we know? A systematic review and meta-analysis of randomized controlled trials. Complement Ther Med. 2016 Jun;26:146-63. doi: 10.1016/j.ctim.2016.03.013. Epub 2016 Mar 26. Review. PubMed PMID: 27261996.